3 BR, 2 BA, Sleeps 8 Max. 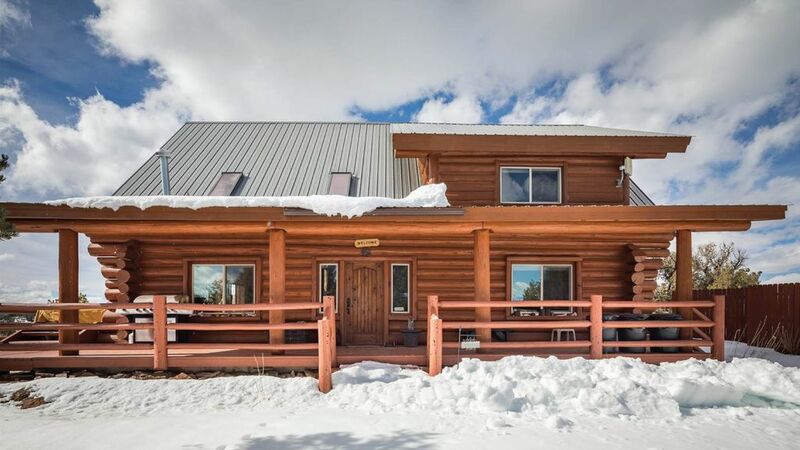 Hi-speed internet.This cozy log home is located on 80 acres of pristine private land with fantastic views of the Southwest Rocky Mountains and the sacred Sleeping Ute Mountain! This property is only 25 minutes from Mesa Verde and only 90 minutes from the Telluride Ski Area! It is only 50 minutes from Durango! The great room has floor to ceiling windows facing south with nothing but trees and rolling canyons as far as the eye can see! The kitchen is fully equipped for your cooking needs, or you can barbeque on the east covered porch with the gas grill. Downstairs there are two cozy bedrooms with double antique beds and a full bath. Located upstairs is the large private master bedroom, which has a king-size bed upon a custom log frame. Connected to the master bedroom is the master bath with a beautiful tiled shower. Central air conditioning and heating will keep you comfortable during any season. After a day of exploring the ancient cliff dwellings at Mesa Verde (only 25 min away), relax in the six person Olympia Caldera hot tub. If you look hard enough you will find pottery shards, arrowheads, possible kiva sites and other scattered remnants of this ancient culture on the 80 private acres the home sits on. Please do not remove or disturb any of these artifacts. If you long for peace and quiet, this is the place. The fall weather is gorgeous, the winters are mild and snow country is only a short distance away. The home rests on the edge of a series of tree covered canyons leading up to a spectacular view of the sacred Sleeping Ute Mountain. Not one other human made structure can be seen from the south deck of the cabin to the Sleeping Ute in the distance. 1 king, 2 double. Central Air Conditioning; Wrap-around Deck; Loft; Antique Clawfoot Bathtub; Antique Wood Stove (non-functional), 80 Acres of privacy with incredible views bordering a national monument of 164000 acres. Beautiful views, great local hikes, unmatched peace in nature! The cabin was comfortable, the main room/deck/hot tub have incredible views of Sleeping Ute Mountain, and views upstairs of the valley and Cortez at night. Great access to canyon of ancients. Cabin was warm and comfortable, nicely decorated. Traveled as a couple with our small dog to the southwest. This log home sits outside Cortez in a very private setting with views of the Mesa Verde. Appropriate for families or couples. We enjoyed walks, admiring the views and exploring the area. Inside the home we found a well stocked kitchen with all appliances and utensils needed to make ourselves at home. Log walls give it a rustic feel but with all modern furnishings. We would recommend to anyone going to the area, and we would stay again. This place is such a gem! Fully stocked with everything you may need; shampoo, conditioner, soap, hair dryer, even coffee and a fully stocked kitchen. It's conveniently located; a short drive to shops and restaurants and within 20 minutes of Mesa Verde National Park, yet secluded and serene. Each morning we explored around the property, then left for breakfast and Mesa Verde National Park, and returned back in the evenings to cook dinner and relax on the quiet, private deck. My only observation for improvement would be all of the stored items in the bedroom closets. Each room had lots of items stored making it a little difficult to fully unpack our own belongings for the stay. Not a major issue, though. Hangers were provided so clothes could be hung up in the closets, which was nice. It was also nice to have a washer and dryer available to use! Overall wonderful place to stay and if we come back to the area, we definitely hope to stay here again! Thank you Robyn & Jason for the wonderful review! The Cabin is a special place and I'm happy you were able to enjoy it. I look forward to welcoming you back in the near future..
Really great property, secluded yet modern! We booked this property for a vacation in mid-July to visit the beautiful parks in the area. Pulling onto the property, you have a gate that must be unlocked and relocked each time, and that is probably as bad as it gets, which is a good thing. The house is set back off the road with plenty of vegetation so that it's not visible from the road. Pulling up, it has a wonderful wraparound porch and circular drive. A large propane grill sits by the front door. I could not get it to get as hot as I prefer for steaks, only getting to around 350° max. The main room is nicely appointed with a large comforable sofa and chair. TV had cable /satellite with plenty of channels. The TV in both the main room and the master bedroom was outdated and smaller than what we're used to, but we weren't in this part of the country to watch TV, so didn't bother us. Beyond the TV room was the kitchen and dining area, again furnished nicely with electric stove, microwave, coffee maker, plenty of coffee, creamer, sugar, and other essentials. Walking outside from the dining area was a nice back porch with table and chairs, and a hot tub. The view from here is amazing, making you think you're the only humans for miles. The master bedroom upstairs had a great bed, it was really comfortable and firm. The master bath was spacious with a very large shower and plenty of hot water. Despite being so secluded, the water tasted great and had no odor as is often the case. The central air worked wonderfully in tandem with the ceiling fans, despite being hot July temps, we were never uncomfortable. In fact, at night the a/c went off and the windows were opened, something unheard of in hot and humid Cincinnati OH. We also experienced minimal flies and mosquitoes, so much so that i slept outside one night just to enjoy the stars and bugs were never an issue. A nice touch was two sleeping bags and mats provided in the bedroom closet for any adventurous outdoors people. The city of Cortez was only about 15 minutes away, with grocery store, Walmart, restaurants galore, for anything you might need. Overall we were extremely pleased with this rental, and would consider it if in the area again! "second best coffee in the southwest!" 30 minutes from Mesa Verde and Four Corners is a bonus. Thank you for the wonderful vacation. We will have memories for a lifetime! Lovely review Rochelle! So happy to hear you enjoyed your stay with us, I'll look forward to your return in the near future! There is great hiking on the 80 private acres or drive a few minutes to the head of Sand Canyon and hike into 164,000 acres of public land. This area contains the highest known archaeological density in the United States. Portions of this undeveloped monument have more than 100 cultural sites per square mile-some individual sites cover 10 acres or more. From this location you can go east to Mesa Verde National Park 19 miles away or keep going to Durango 53 miles away. In Durango ride the narrow gauge train to Silverton or have an evening meal at the Bar D Chuckwagon [reservations required]. Travel north out of Durango to Durango Ski Resort, or keep going over the Million Dollar Highway to Silverton and Ouray. Next head to Telluride and ski down the beautiful snow packed slopes at Telluride Ski Resort. You can go south and gamble at the Ute Mountain Casino about 15 miles away. Visit the Ute Mountain Tribal Park where they give guided tours through their Indian ruins.